If I had to guess the political persuasion of Wilson’s Snipes, I would say most of them are probably Reaganites. While I generally dislike painting an entire species with such a broad brush, it’s obvious that Wilson’s Snipes are great believers in one of President Reagan’s favorite maxims: Trust, but verify. Snipes clearly trust that the Fill is a safe place to hang out during the fall, winter, and spring, but they constantly verify that no predators are about to pounce on them. They look up into the sky for enemies almost as much as they look down at the ground for food. 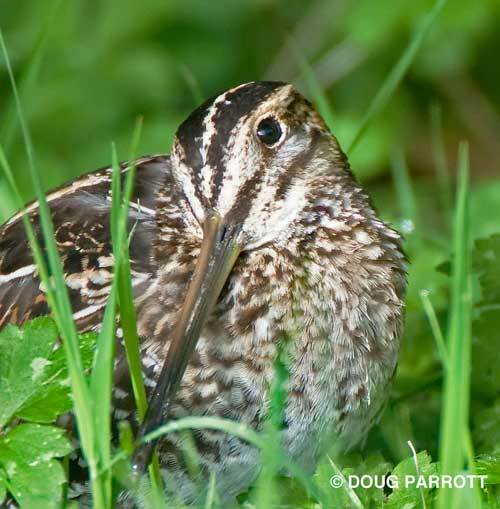 Wilson’s Snipes are freshwater shorebirds with short legs and Jimmy Durante beaks. They are arriving at the Fill now in numbers. Yesterday I found four in Hoyt’s Meadow. If you’re lucky, you may come upon one foraging on the mudbanks of the Lagoon, ponds, and Waterlily Cove of the Fill. Their favorite food is worms, crustaceans, and insects that burrow into mud. Snipes hunt by probing the soft mud with their long bills, which are loaded with sensitive nerves at the tips so they can feel out a likely morsel. Occasionally, snipes fly over to the prairies to pick at food or seeds they find on the ground. Wilson’s Snipes are plump, tasty menu entrees for a variety of raptors that regularly come to the Fill, including Peregrine Falcons, Merlins, Cooper’s Hawks, and Sharp-shinned Hawks. I’m sure the local Red-tailed Hawks who usually prey on rats wouldn’t say no to a snipe if one were offered, either. With that many fearsome predators seeking your demise, it’s no wonder Wilson’s Snipes are conservative in their habits. Without sharp bills or long talons, snipes’ only defense against attack is to be wary and to hide. That’s why they have eyes set almost on top of their heads (so it’s easy to scan the sky), and cryptically colored feathers (so they can blend in with their surroundings). Their beige, brown, white, and black feathers camouflage them so completely that we birders usually see them only when the birds flush from hiding and fly away. Most of us are more familiar with the back ends of Wilson’s Snipes than with the whole bird. Makes it hard to verify they’re here, but I trust that if I am patient and persistent, I will find them. This entry was posted in Uncategorized on October 2, 2011 by constancesidles.